Welcome to Mahora Academy, an all girls school that has a star teacher there by the name of Negi Springfield, a 10 year old prodigy and wizard in training! This is a fun filled flick very similar to Love Hina with it’s flirtatious nature, which is somewhat disturbing with the fact that it’s directed at a 10 year old boy by slightly older girls. 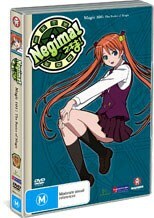 The show is very funny throughout with cutesy humour and of course missing parts of young girls clothing as Negi’s spells “back fire” and create awkward moments and a lot of laughter for the audience. Naturally the girls have trouble realising that a 10 year old is their teacher and this also provides some really weird moments. The quality of the video is similar to what one would find on the television and the ratio is also 4:3 with the option of both English and Japanese audio. There are image galleries here and character profiles and trailers, not really much to get into. There are some really neat characters in this series and the animation style is pretty decent. The story is a little slow to get going with so many characters involved, but once it does, the kids adventures are pretty cool. Fans of the manga from which this anime is derived be aware that whilst it loosely follows the same route, it is edited down somewhat in terms of content and the storyline does differ. It’s still a cool experience though and one that I can recommend for a light hearted laugh. There are six discs in the series and six episodes on this disc.